Luxury Pre-Erected Tents that make camping a joy! 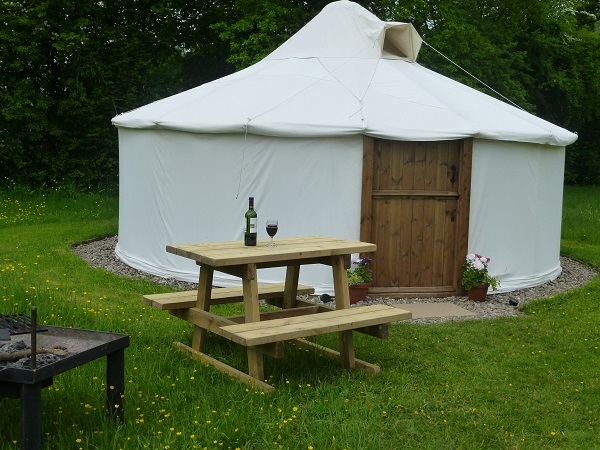 Our lovely looking yurt, which provides beautiful spacious accommodation sleeping 2 + 2 on twin or zip together double bed. It boast a bueatifully set up cooking facilities with a woodburning stove creating a comfortable and warm atmosphere to relax in. Due to the popularity of Tylau Yurt, over the winter Mick will be adding to our Pre-Erected tent range by building another similar construction. It may not be exactly the same, but it will be similar to our current Yurt in so much as it will sleep 2 + 2 persons, will be built on a raised deck, made from qualitry canvas, have a wood -burning stove and all the other comforts you would expect from us. If you are interested, watch this space or register an interest with Sharon by email.